"...the PA200K was my favorite route in PA so far. Not only challenging, but also scenic..." -- Juan Salazar commenting on last year's event. There's still time to register for the March 27th PA200k -- reminder: if you are a PA R-12 Club member, you can just drop me an e-mail to let me know if you plan to ride and optionally stay at the hostel. You can pay me the $25 entry fee when you sign in, which includes both the $5 membership discount AND the automatic early registration discount of $9 -- a $14 savings. They are "highly recommended" -- although it will be possible for many riders to complete the course before sundown, unforeseen circumstances may keep you out on course past sundown (in which case, you will be DQ'd, which will be the least of your problems). That being said, any veteran PA200k riders who have completed the course in less than 11 hours can forego a headlight, if they are willing to take that chance. The start/finish is at the Weisel Hostel in Quakertown, our "rando clubhouse". There are dorm rooms available for $25/night on both Friday and Saturday nights -- if you are traveling far, this might be a cost effective option to consider to avoid a lot of driving right before and after the event. Please note that the start time is now 7AM. A breakfast buffet of hot oatmeal and other breakfast items is available 1 hr before the start, in the hostel's great room. This is also where the sign-in area is. After the ride, there are 2 showers available in the upstairs bathroom. Also included is a postride BBQ, where you can swap your war stories and share your goals for the 2010 season. Please note that the hostel is located in a "rustic" area -- cell phone coverage is poor, if you need to reach me, be sure to try the hostel phone number (listed on your cuesheet and brevet card) if I don't answer my cell phone. Also, the dirt driveway has a lot of potholes and rocks -- take caution. You should park your car in the large parking area on the right of the long driveway between the road and hostel. If it is wet, be sure to park on the gravel area, NOT the grassy areas -- it is easy to get your car stuck if you wander into a soft grassy area. The few parking spots next to the hostel are reserved for event personnel and the hostel parents: John and GerriAnn. I completed a volunteer preride this past Saturday ... an updated cuesheet (draft 5) was posted on the website on 3/21. A small routing change was made around mile 14.8 of the previous draft -- the bridge construction from last year is now complete, so the Woodline/Kichline/Buttermilk detour is no longer needed. Some other minor clarifications were also made in various spots. I gave some thought about tweaking the course a bit. I could've taken out the Lower Saucon climb, now that River Rd is good between Riegelsville and Phillipsburg. And I got a lot of complaints last year about the Cafferty/Tohickon Hill stretch at the end, which is quite a bit harder than the original routing along the south shore of Lake Nockamixon. But after doing a preride this past Saturday, I'm happy with the way it is -- yes, a very challenging route with lots of big climbs, and plenty of "other stuff in between". However, it is an extremely quiet route with minimal traffic (putting aside the occasional pack of the motorcycles that are just unavoidable). It is what it is ... a hard 200k that will offer a good early season challenge for most riders. In general, the roads are in fair shape ... there is still plenty of gravel on the shoulders, so be mindful of that, especially on the corners. Also, the gravel made some of the very steep pitches a bit harder -- so if you are unsure of your ability to handle this, you should unclip and walk. 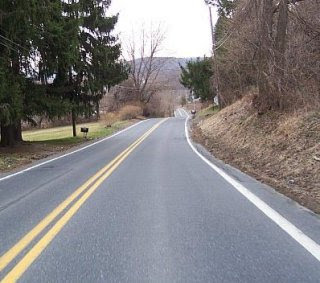 While some roads are a bit worse after the harse winter, one bit of good news is that Rt 32 has been repaved -- this is a relatively busy, narrow road but the small shoulder is now at least rideable and no longer cratered with potholes. The Eastern PA region is offering a Fleche on April 22-25. Event details are posted here. Check out last year's ride report (with maps of the different team routes). Route submissions are due by April 9 ... so now would be a good time to get your plans together!